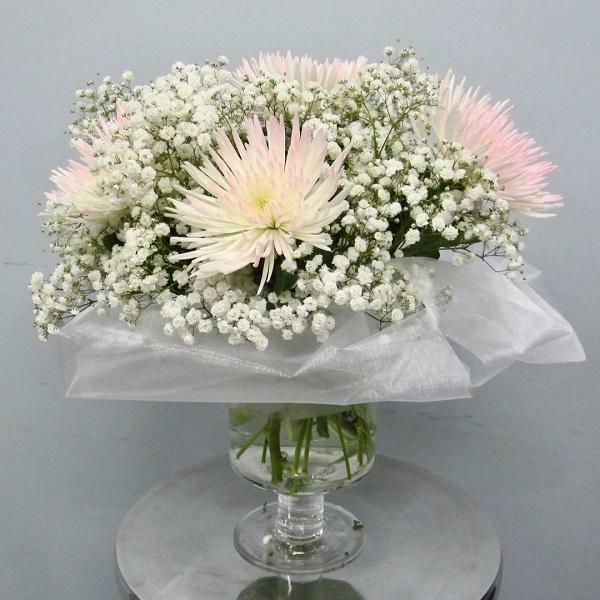 Today they are the most trained bouquets of flowers that look relaxed and have plenty of greenery. You will agree with me that a warm home without any flower or plant can hardly be called a warm home. Plants fill our space and, compare with other decorations, are the most beautiful detail of each space. They demand care, but they give beautiful flowers and leaves. 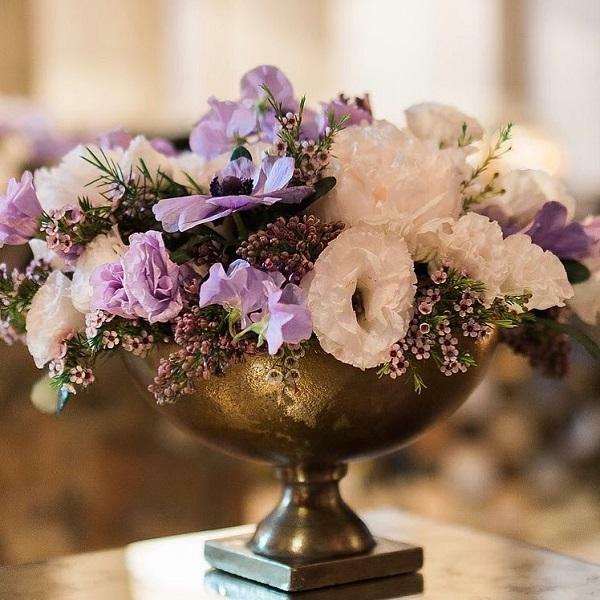 Floral arrangement on a table or shelf are also a frequent detail at most of homes but also at every celebration. There is no celebration on which tables are not decorated with luxurious floral arrangements and bouquets. 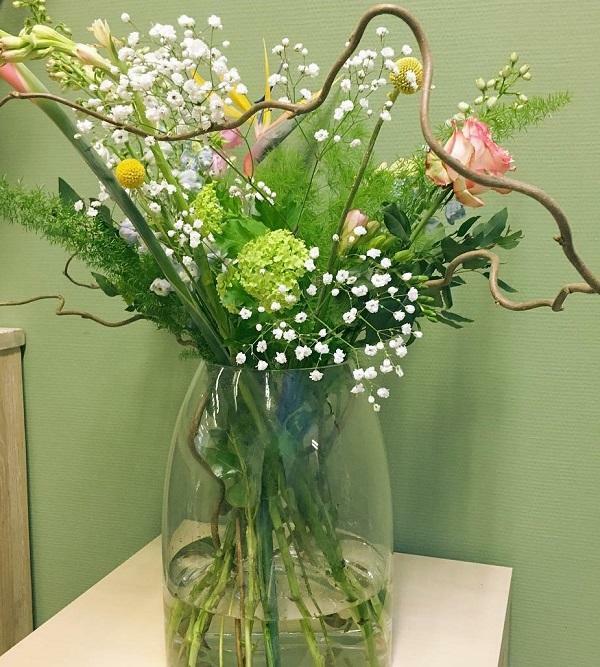 Flowers refresh the rooms and make it more comfortable to stay, whether it’s a home or business space. The choice of flowers is huge. Arrangers just need to choose the one that best suits their needs and which fits best in the whole picture space. 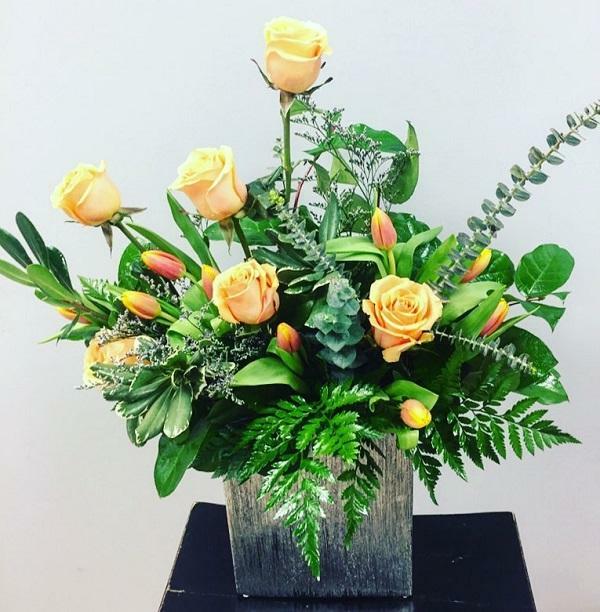 Roses are the most sought after flowers, but there are also orchids, tulips, lentils, lilies… You have a handful of vases, sticks, greens, berry trees and you just have to use your imagination and make your own floral arrangement that will adorn your space. Or buy it, if you prefer so. 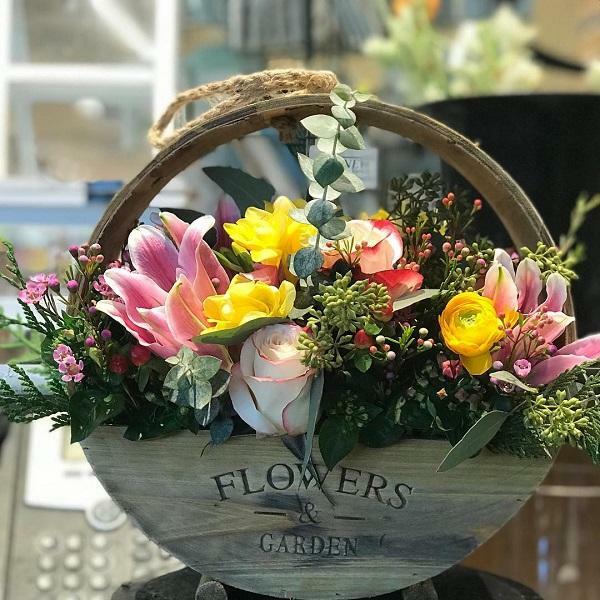 How to arrange flowers depends on what flowers you choose, where you will put your arrangement and for what occasion you need it. When talking about the place where you will put your flowers, you will agree that in a rare place in the house it will not stand well. 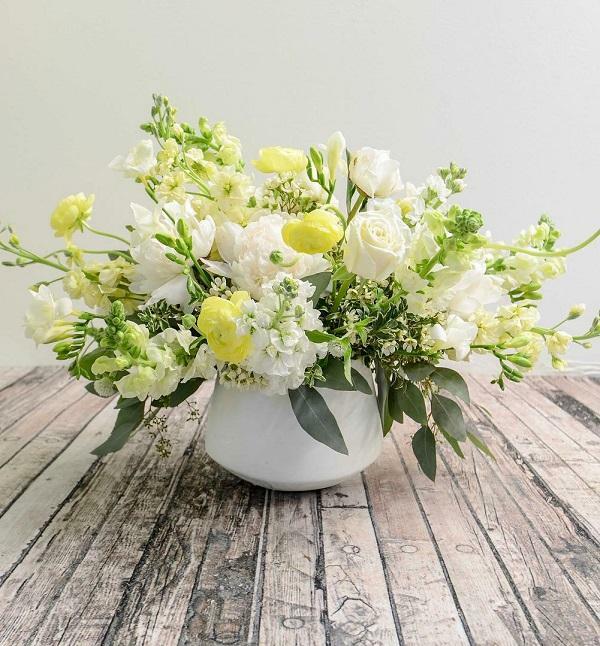 Two basic styles in making these bouquets are a vertical floral arrangement that is usually tall and narrow, and horizontal to decorate the middle of the table. 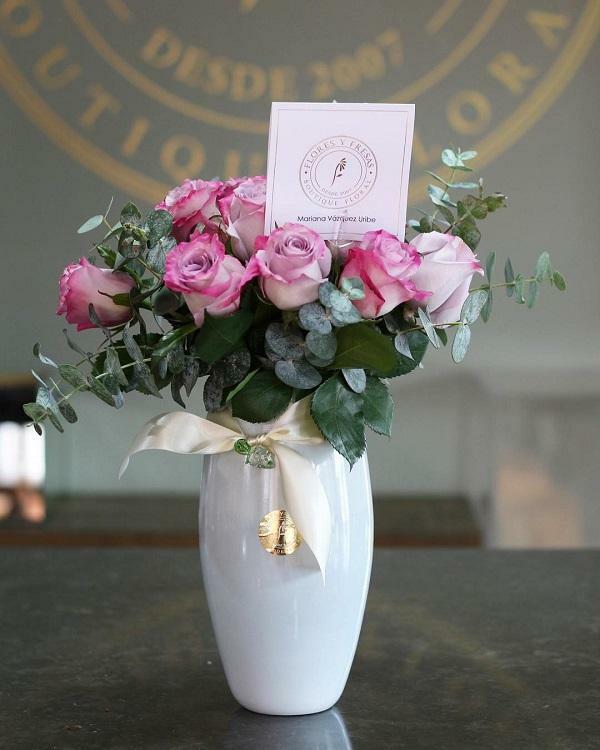 Also, the floral arrangement may also be oval, round, small, in the form of letters S or young Moon. It’s up to you to choose. 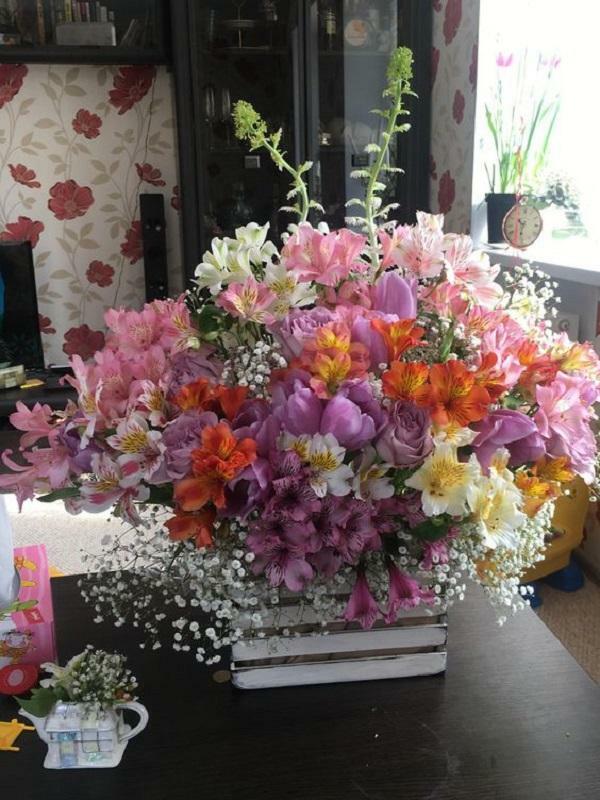 Three categories of flowers are used in arranging. Linen flowers that are long and give height, balance and width. 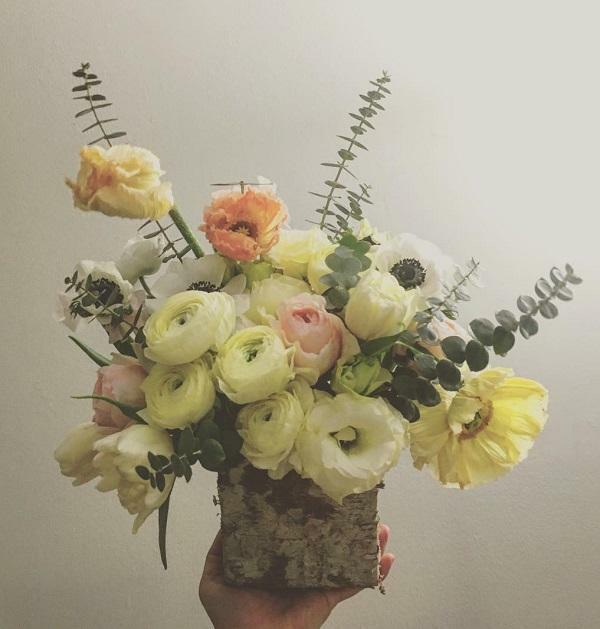 The second category is the flowers that fill the empty space and it’s about stems with lots of tiny blooms. 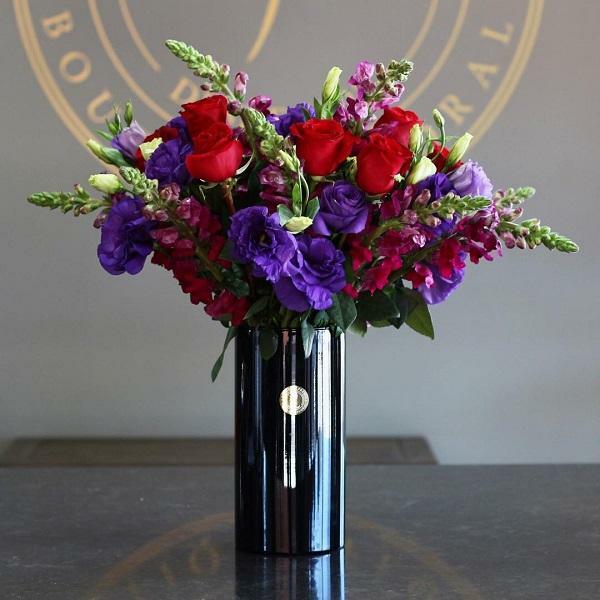 And the third category is the main flowers, which give volume tp arrangements and attract the most attention. 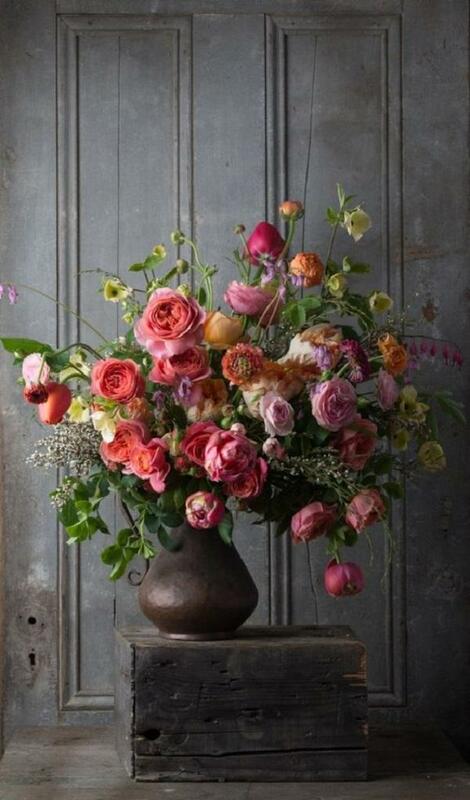 The central flowers in most arrangements should be higher than the rest of the flowers. 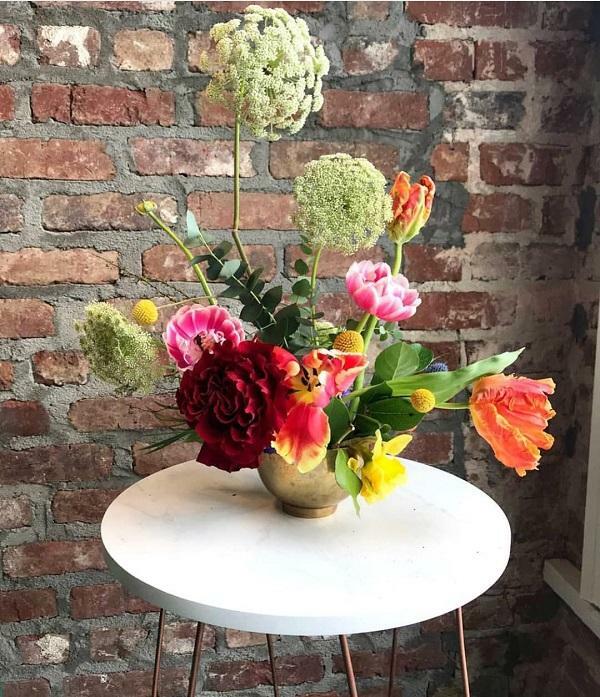 You need to cut the central flowers so that they are as high as the two heights of the vase or container in which you place it. 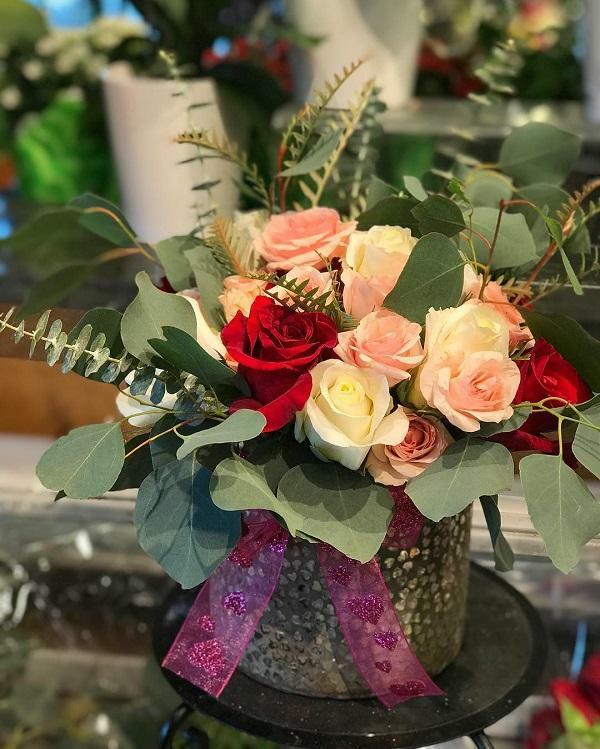 If the containers are wide, it would be good for you to put a mesh on them that will keep the flowers and prevent it from moving. How important it is to choose the right flowers it is important to choose an adequate vase. The choice of the vases is enormous. 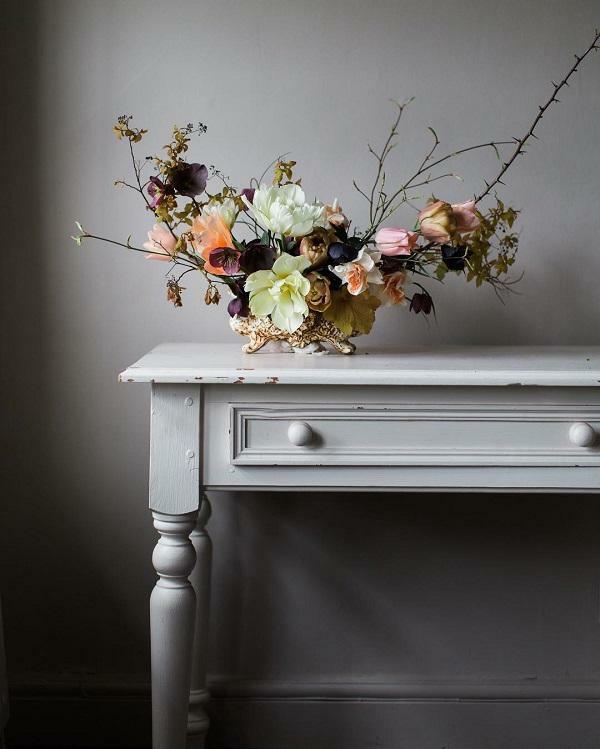 The choice of a vase determines whether the decoration will have modern or rustic note. 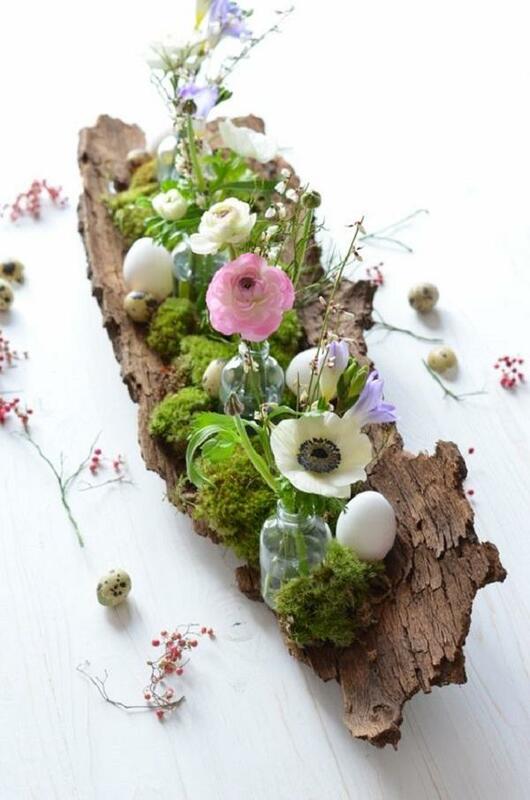 You can use old jars or bottles for this occasion. Color them as you like, you can achieve rustic look if peel off the paint at some places. This is a very creative solution for the use of old bottles and jars. 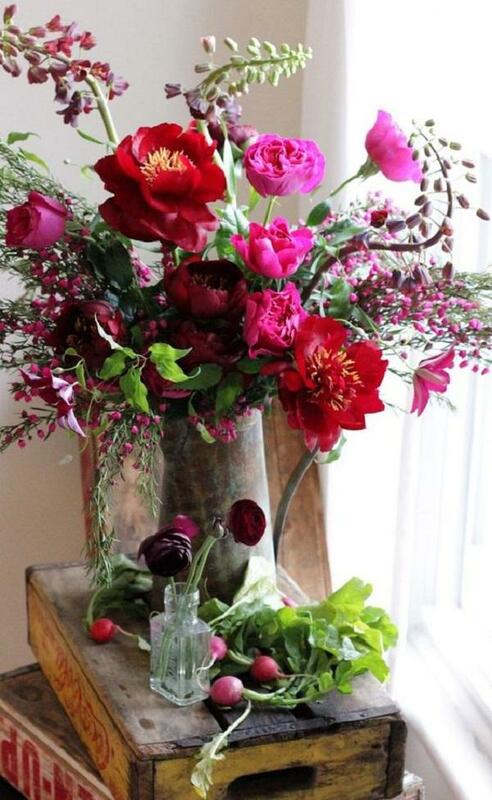 You can compare several bottles or jars with flowers to one another and thereby enhance the overall impression. 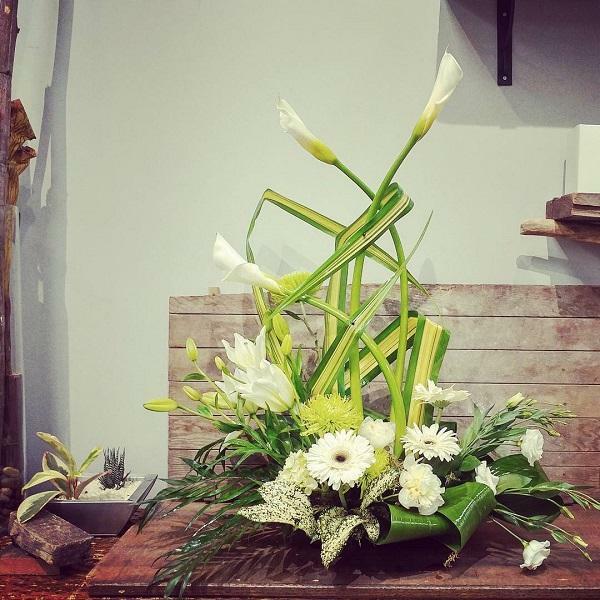 There are a lot of ideas, it’s enough to know what you need for a flower arrangement and make it yourself. Only a little imagination, will and creativity are necessary. And a few favorite flowers. Enjoy the gallery! In addition to flowers for making flower bouquets you need a lot of twigs with lots of tiny flowers, leaves, branches, vases, gloss. 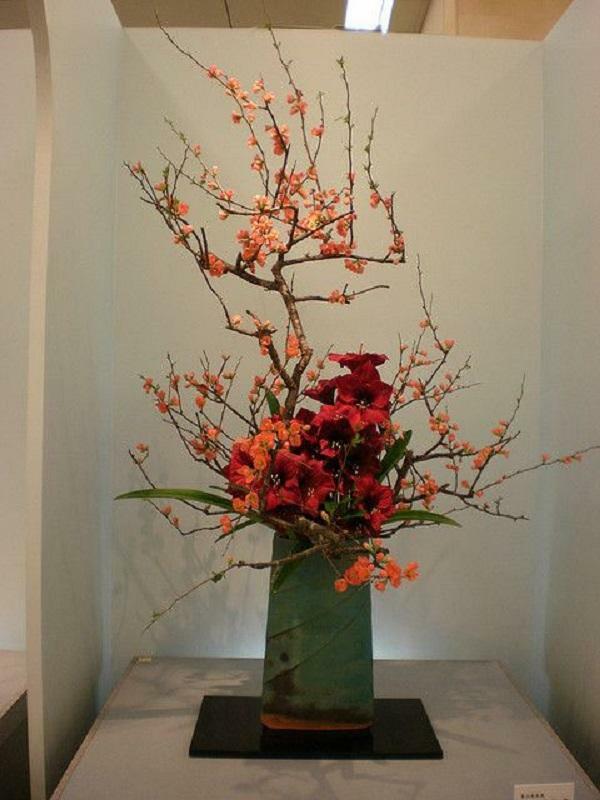 All that will complete the flower arrangement and give it a form. Roses are the most wanted flowers for making floral arrangements. 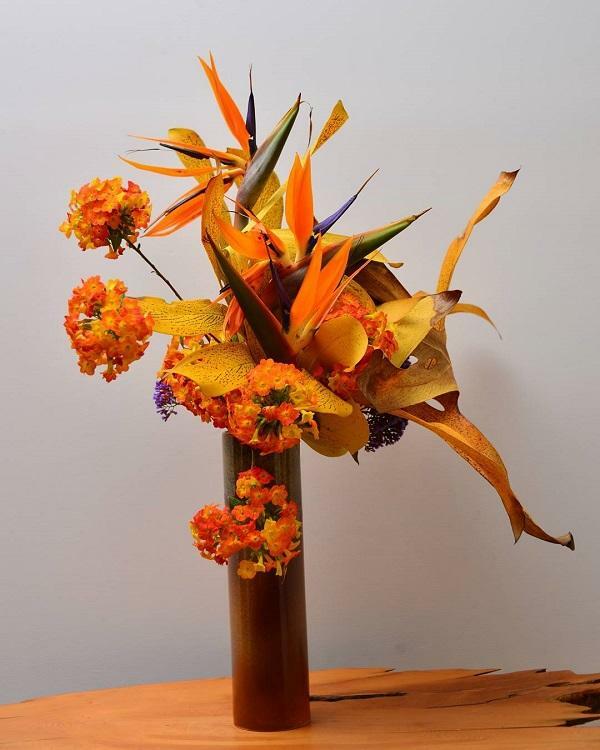 Unusual containers for a flower arrangement or vase can greatly contribute to the appearance of the bouquet. 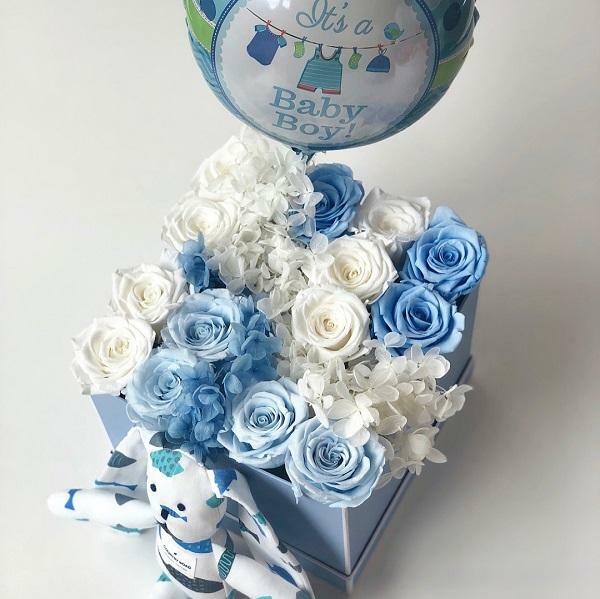 You can congratulate birth of a son to your sister or friend, and this way. You will not leave her indifferent. The biggest stamp to this arrangement did not give flowers but the bark of a tree as a detail that made a compact unity from small bottles with a flowers. 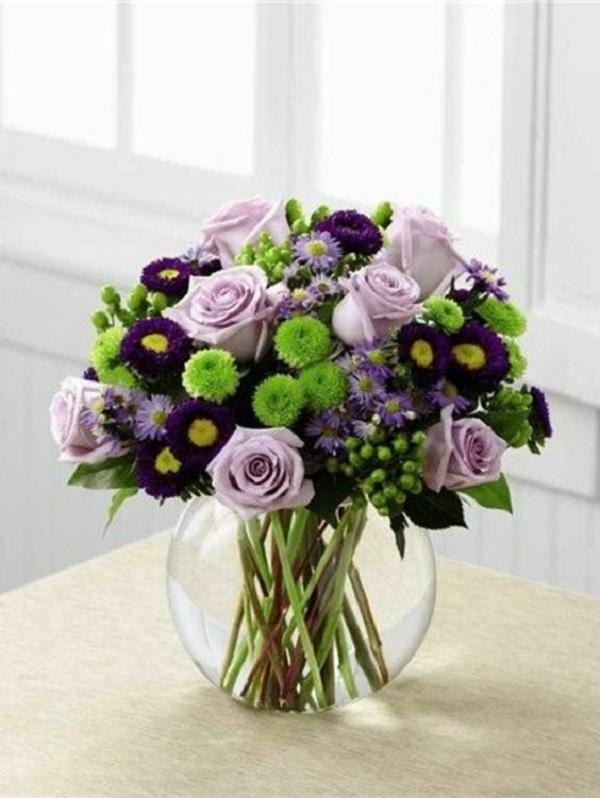 The main flowers in this bouquet are roses, and purple flowers and greenery are there to complete the bouquet. Flowers do not mind to stand in the water even its good for it. Vases made of glass with flowers easily fit into every interior. 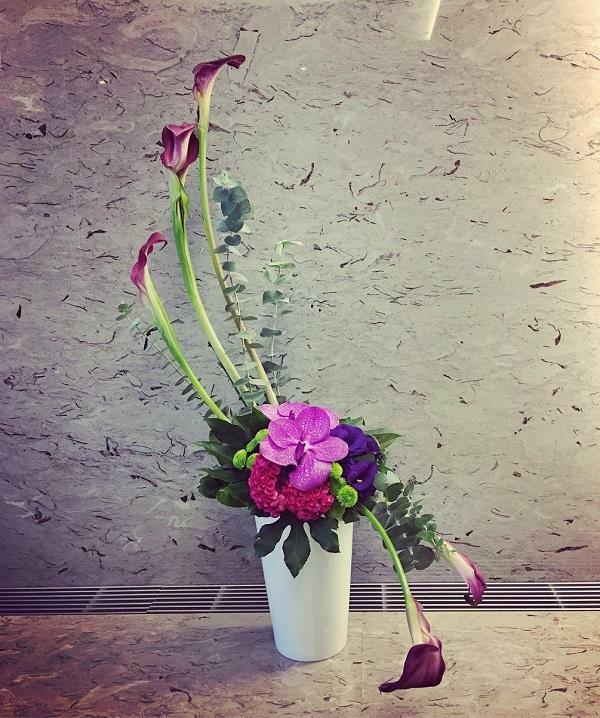 In this arrangement, orchids are more important than rose. 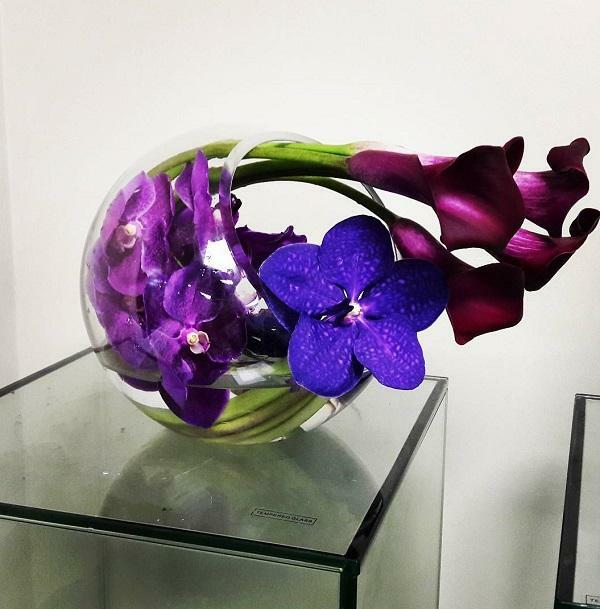 Flowers that are a symbol of love and beauty – orchids, is extremely popular and is required for all occasions. 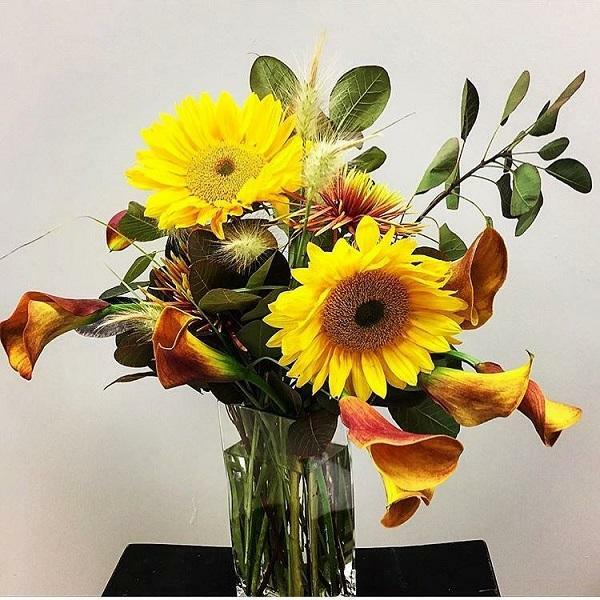 Flower arrangement is an excellent gift but also excellent decoration for every occasion. Red and pink colors are the most beautiful colors of flowers. No woman can be indifferent to the flowers in these colors. White flowers are symbol of simple beauty, innocence, respect. 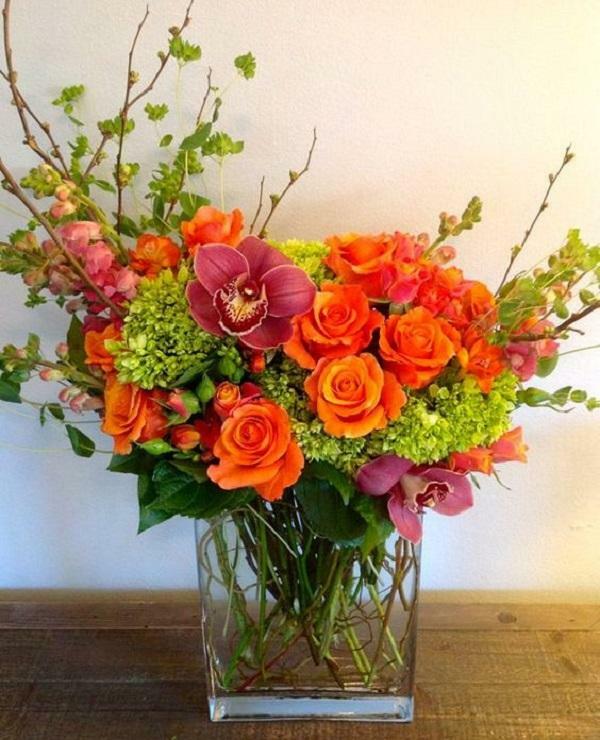 When choosing a flower arrangement, keep in mind that the color of flowers is as important as the type of flowers. Rose is a queen of flowers. It was still in Persia known as a beautiful, fragrant garden flower. 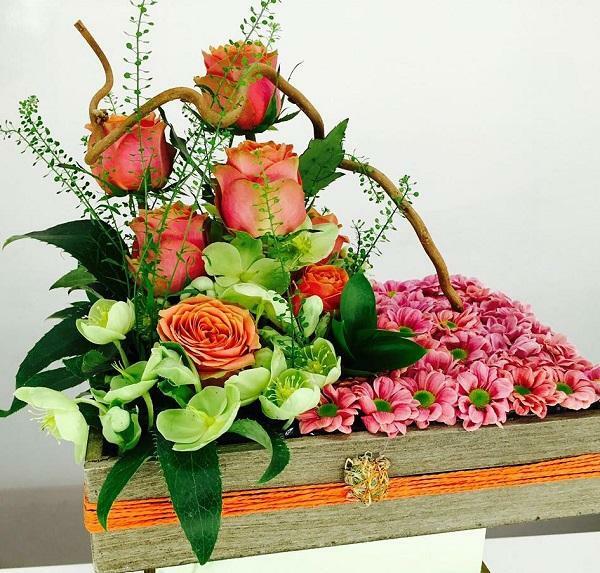 The wooden container in which the arrangement is placed gives a special note to the whole look. 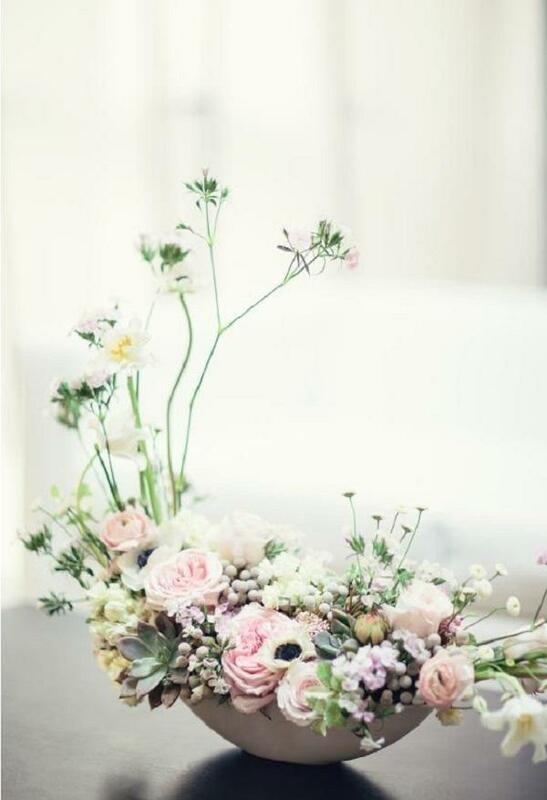 A lot of greenery will make your bouquet look like you have now picked it up in the garden, naturally and ecstatic, and that’s what is being sought today. 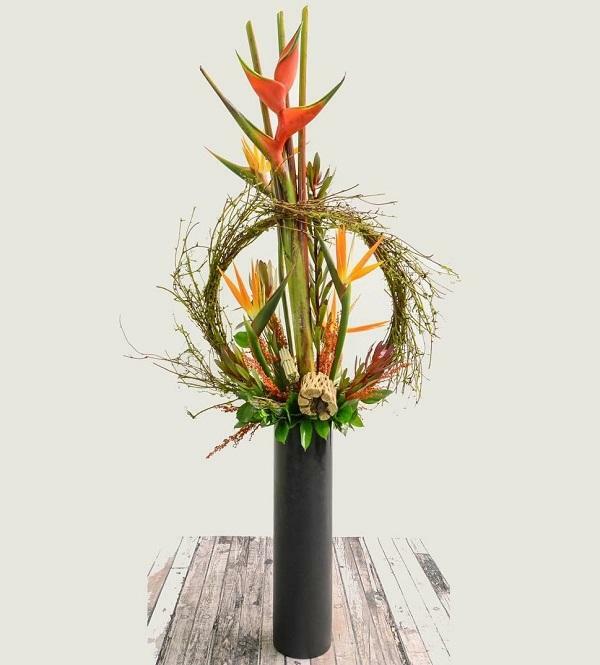 For office space or your living room this somewhat unusual arrangement will look very modern. Plants are what gives the room the warmth whatever kind of variety it is. 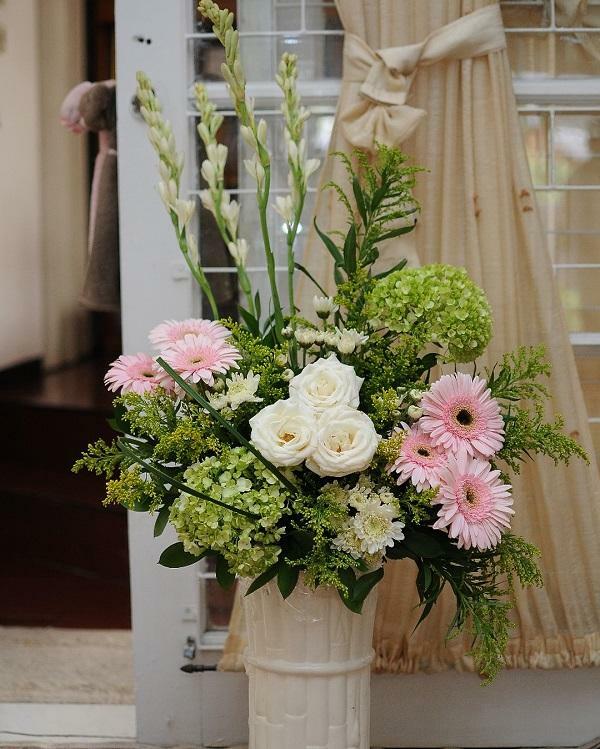 Bunches in bouquets are a very important detail that changes the impression of the whole bouquet. 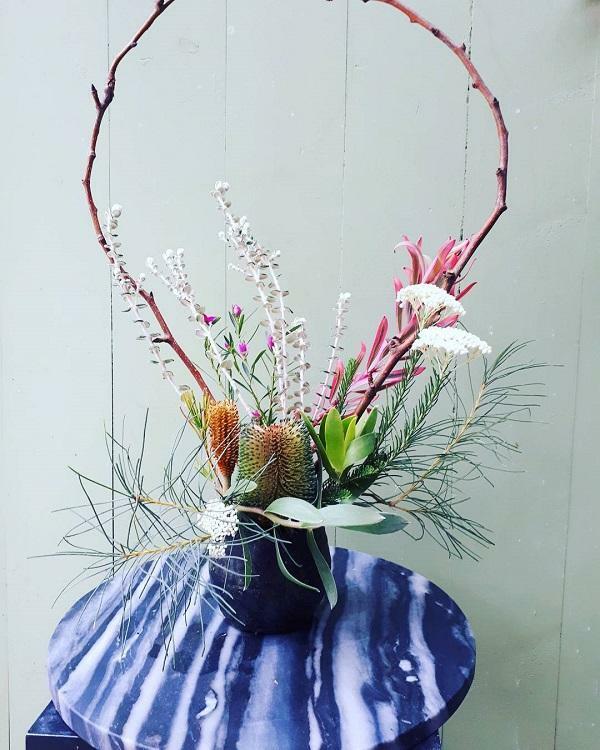 This interesting branch made a simple bouquet very trendy. Zantedeschia aethioipica is a flower known for thousands of years, and through its history its symbolism has changed. What is sure, the Zantedeschia aethioipica does not leave people indifferent for thousands of years. This is a flower that reflects elegance. Hydrangea are a perennial flower that does not require special care and gives beautiful flowers. It exist in a lot of colors. Hydrangea will be beautiful decorations of your garden but and room when you put a few flowers in the vase. 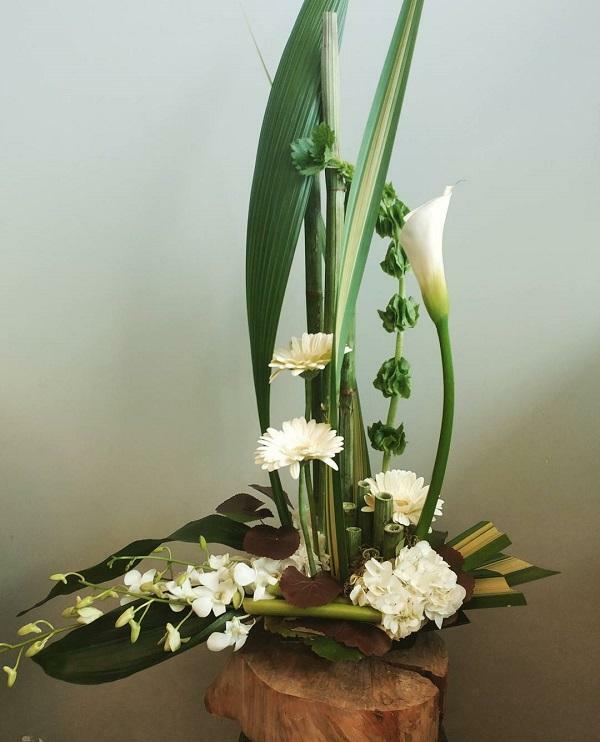 This white arrangement made up of hydrangea, zinnias and calla will be a beautiful decoration of every table. 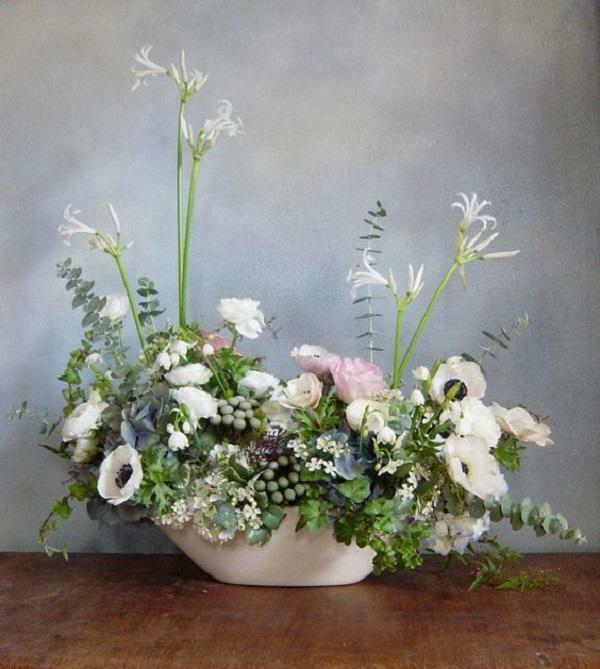 This extravagant floral arrangement is for the temperamental ladies of refined taste. Tulips are the most beautiful decoration of many gardens, homes, and celebrations in the spring. Peony are very luxuriant flower. It will decorate your space and everyone and surly will be noticed. This flower combines perfectly with roses and chrysanthemums. If you have a garden where you often hang out with friends, decorate it with one such arrangement. Very original. Put in a bouquet and a couple of high flowers. The effect will delight you. 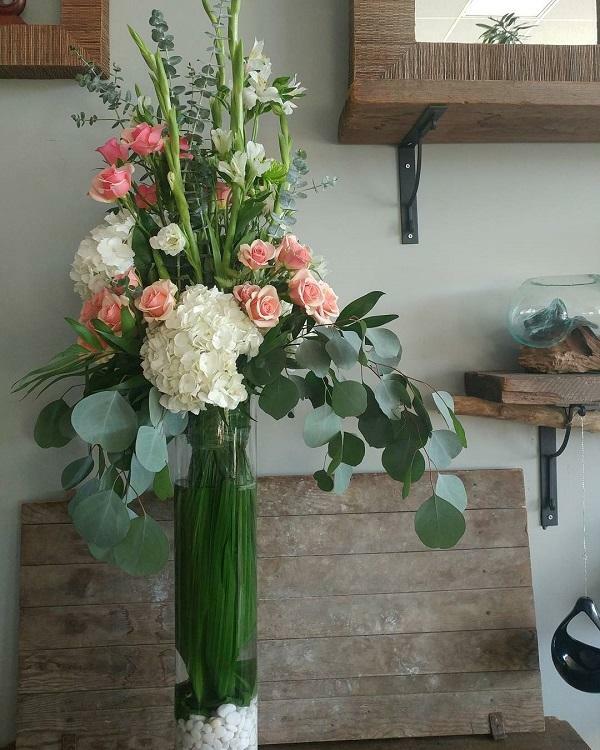 Flower arrangement in lovely delicate colors of pink and orange, fill with twigs with tiny white flowers. 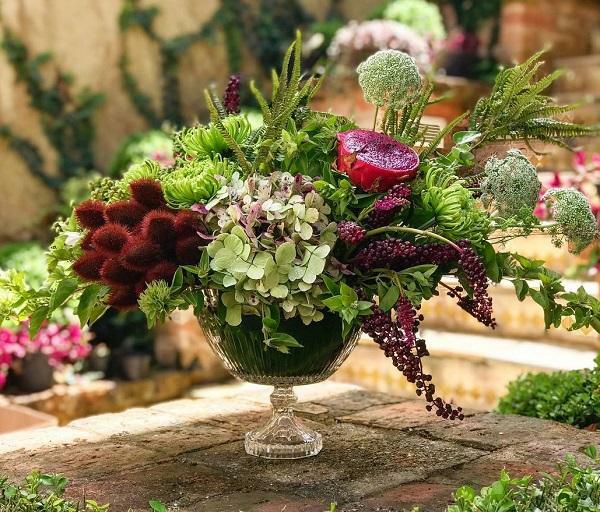 The English style in the arrangement is characterized by a circular form of bouquets with many seasonal flowers and greenery. 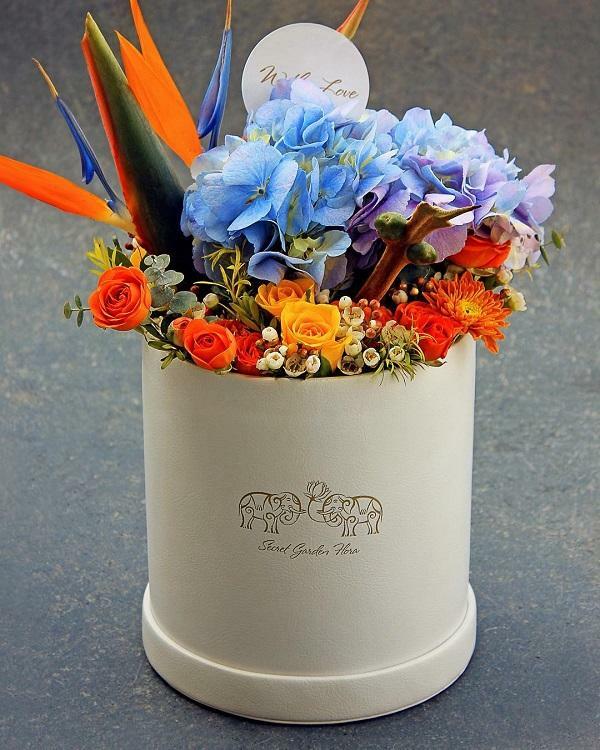 Plaster containers and earthen vases are an excellent choice if you plan to put flowers outdoor. 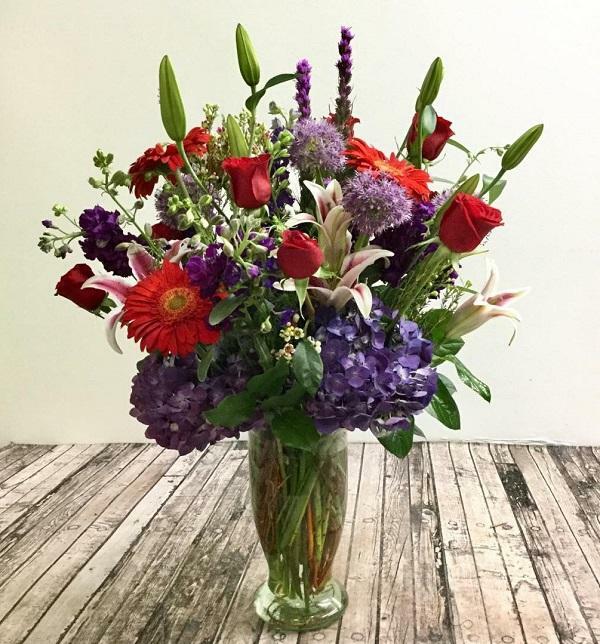 Red bouquets will make all your joyful and tender moments in life even more gentle and joyful. For most people in the world, roses are flowers that mark love and romance. When the flowers are concerned a lot of colors is always allowed. Flower bouquets in various colors are playful and happy and bring smile on face of person who see it. 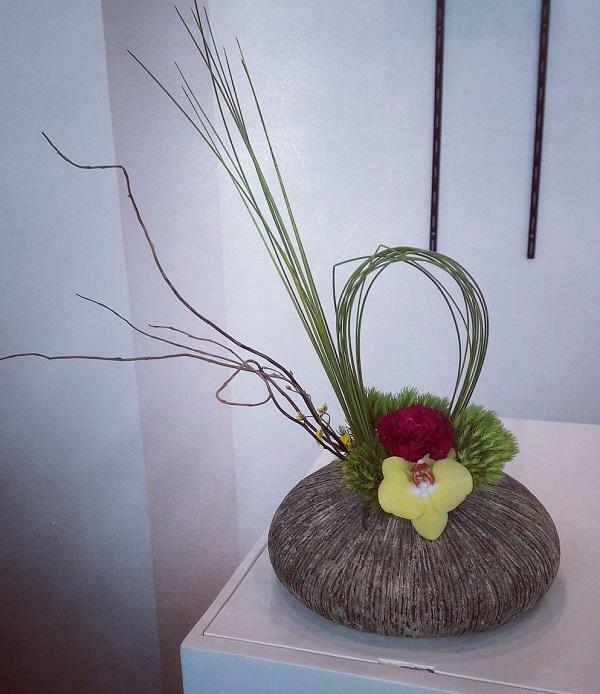 Ikebana originates from Japan, it is Japanese art of flower arrangement. For making ikebanas obligatory is used fresh flowers. It was gifts to Buddhist temples in beginning. 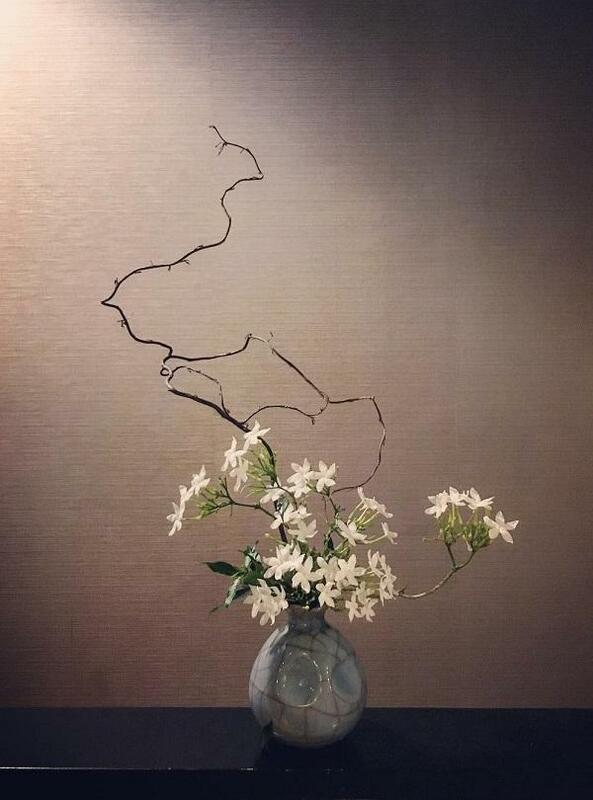 The spiritual background from which the layering of flowers arises is the basic difference between the arrangement and the ikebana. 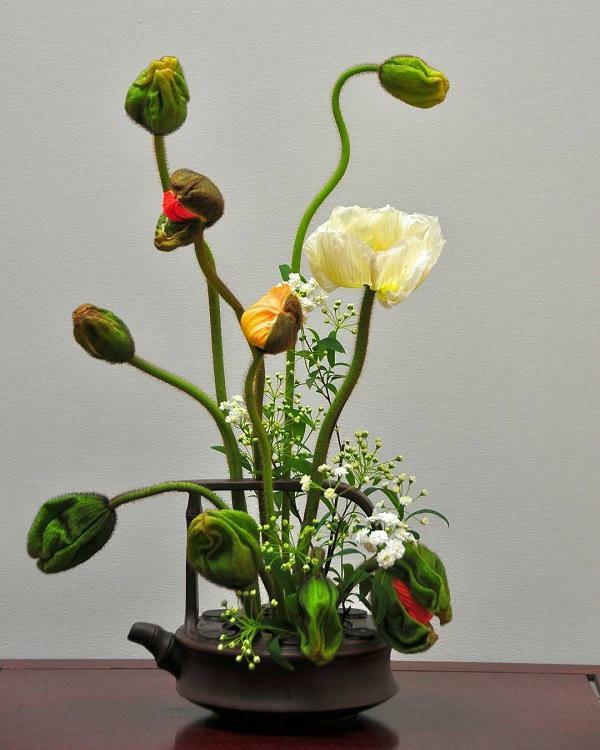 Ikebana primarily has a religious goal that is some kind of way to knowing. Flowers in an ordinary glass vase is enough decoration for each space, but be free to play with fruit, feathers and candles also. 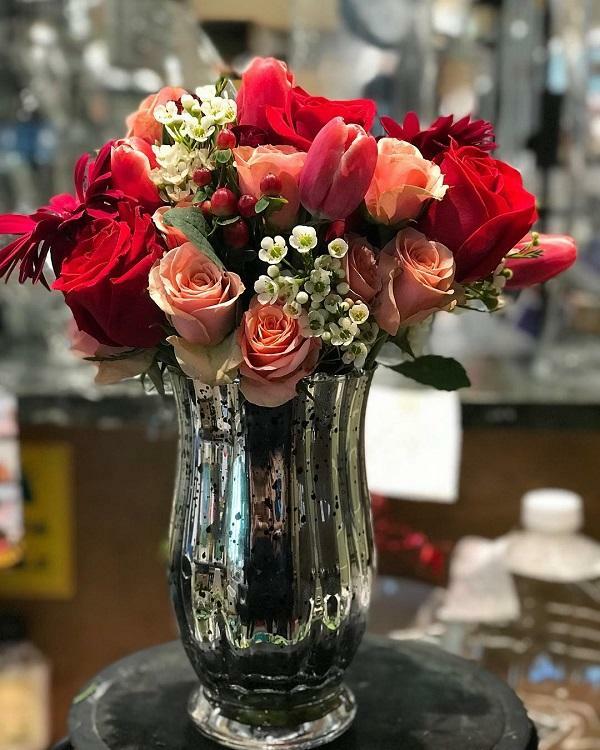 Decorative vases will especially highlight the beauty of your flowers and give the whole arrangement a special dimension of aesthetic experience. 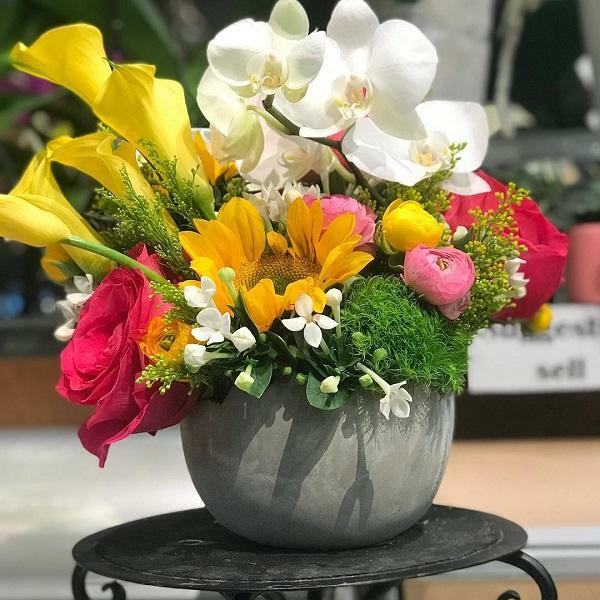 Vases made of wood, glass, metal or ceramics of various colors combined with decoration materials will make your arrangement perfectly harmonious. Orange roses have different shades of this color. 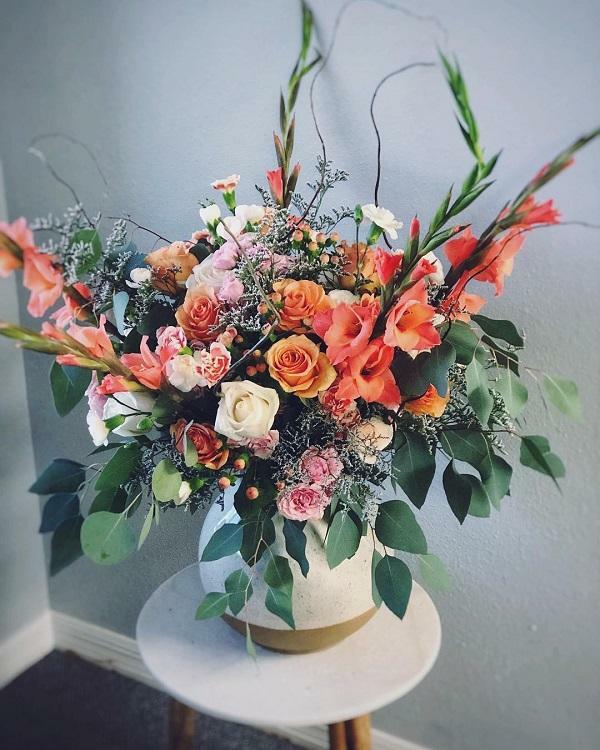 From light orange through the coral color to the color of apricot. 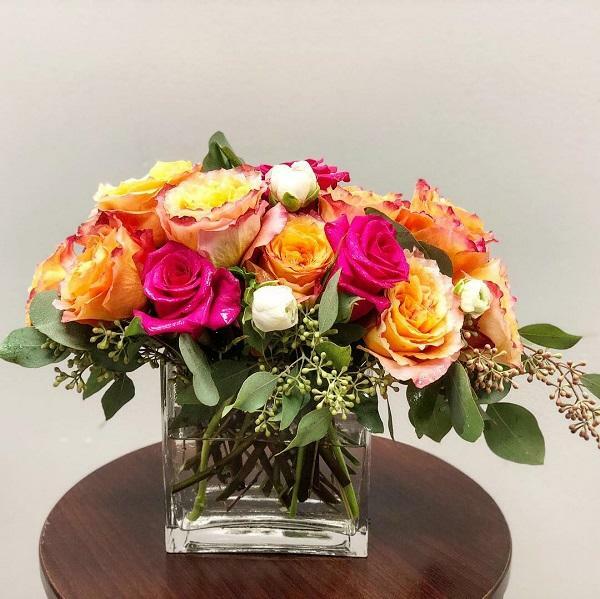 These roses quickly captured the hearts of flower lovers, and its fire color is associated with passionate thoughts, sunsets and sweetness of citrus. Sunflower is a flower of happiness, a symbol of loyalty to humanity. It can be wonderful gift for a dear person. 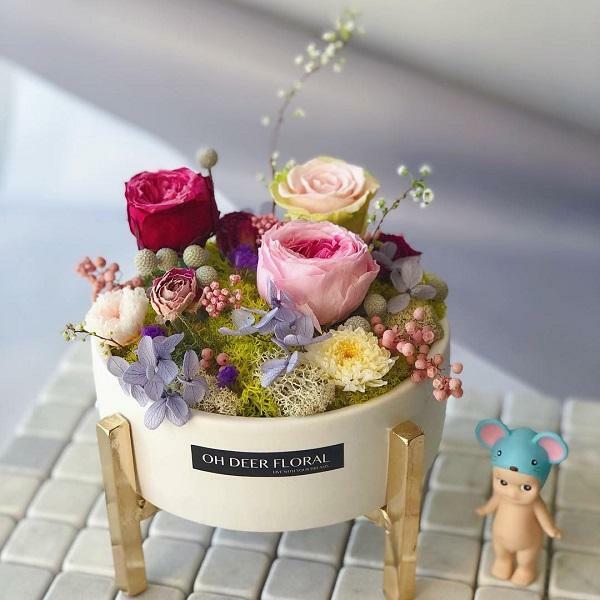 A very interesting container in which the flowers are located, actually a small crate. Huge bouquet with two high flowers in the middle to reach the height of the bouquet. 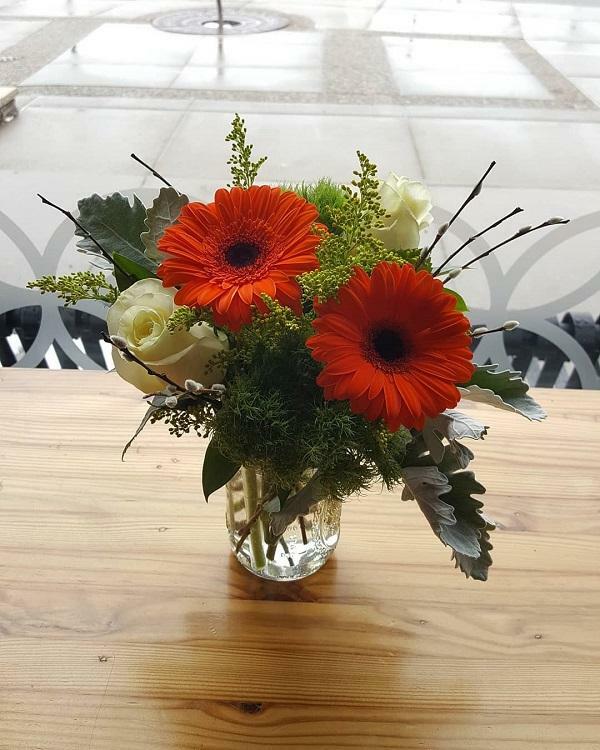 If you get for gift a bouquet of gerberas and roses be proud because someone wants to tell you that you are graceful and irresistible. 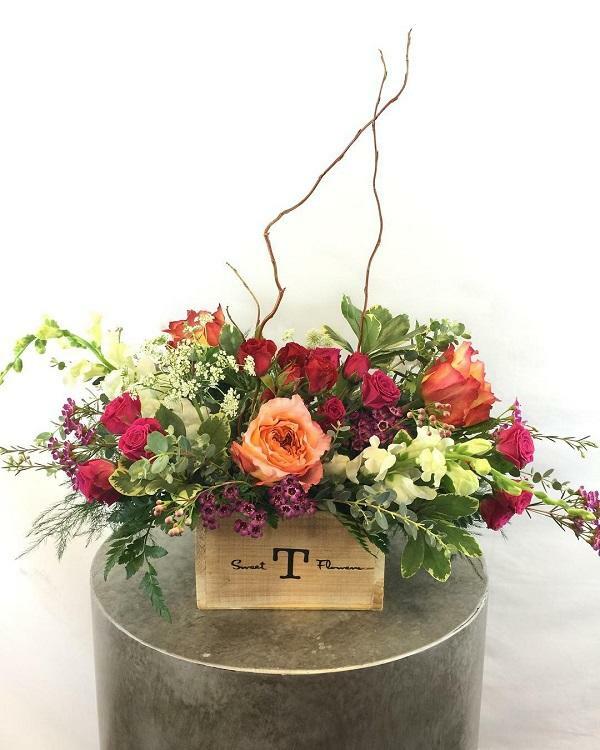 Low rose arrangement complemented by small twigs with tiny flowers and berries. 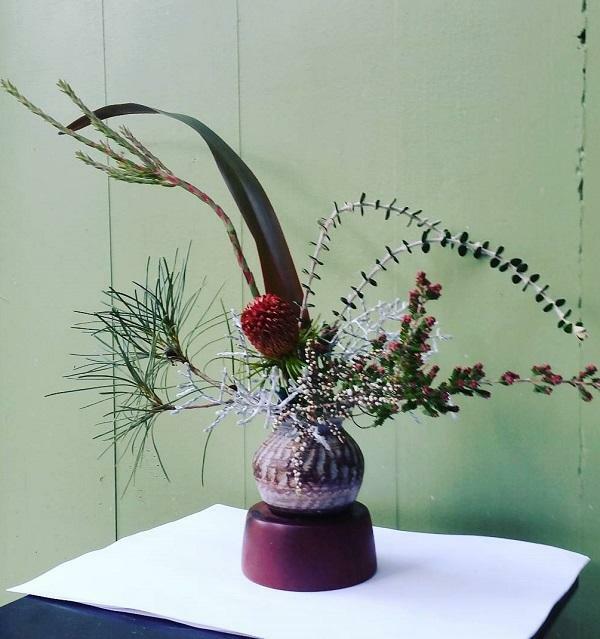 Place moss on the surface of this arrangement – it will look wonderful. Seven flowers are given on the day of engagement. When you want someone to say that you are grateful for long friendship you give eleven flowers, 15 when you want to express your respect for some for good gesture. Thirteen flowers you do not really have to give someone. In Russia believe that you want to send so message of hate and that despise someone. 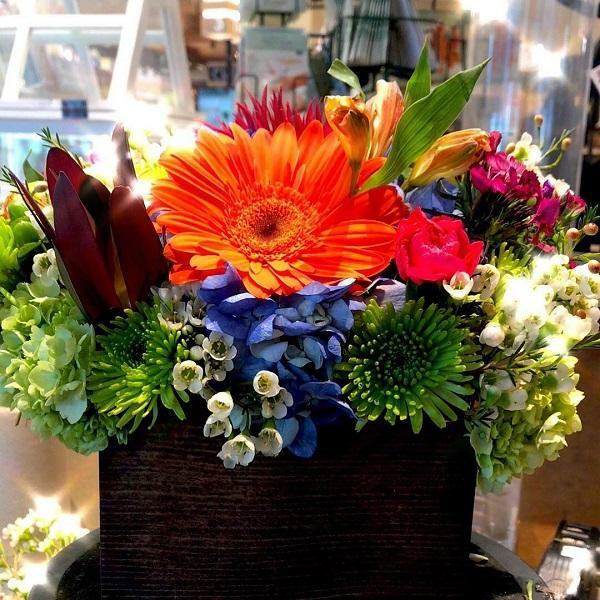 There are not many flowers, but you have to admit that the flower arrangement is very effective. 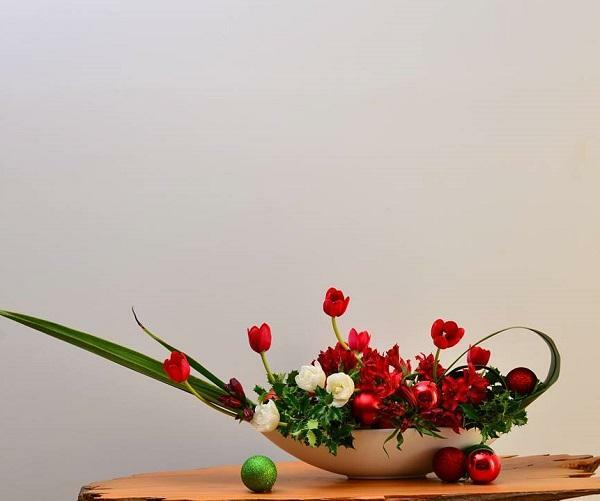 What apart from flowers can give a special note to your arrangement is a form, try with such an unusual vase with a hole on the side. 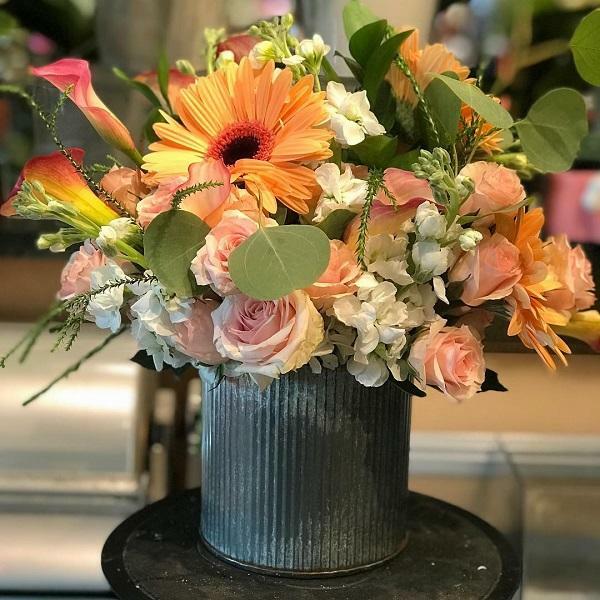 Metal containers can give the arrangement a rustic note if they are properly connected to the selected flowers and other details. 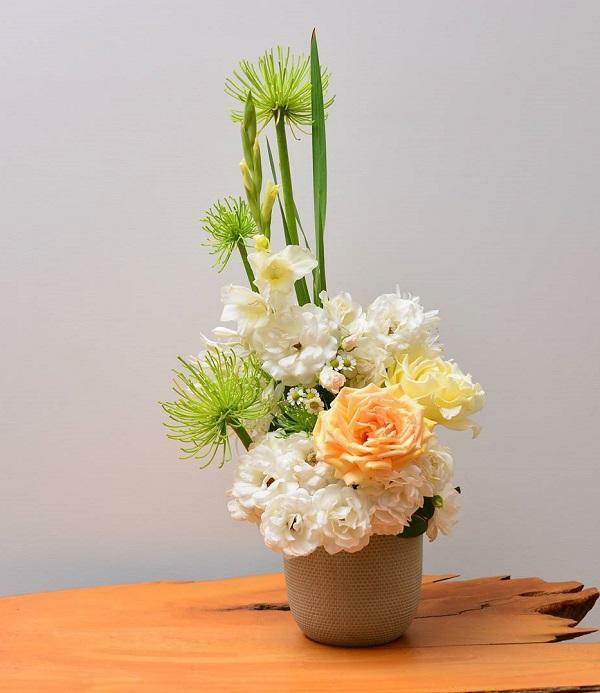 Carnation is very beautiful and often in floral arrangements. Among ladies it is one of most popular flowers. 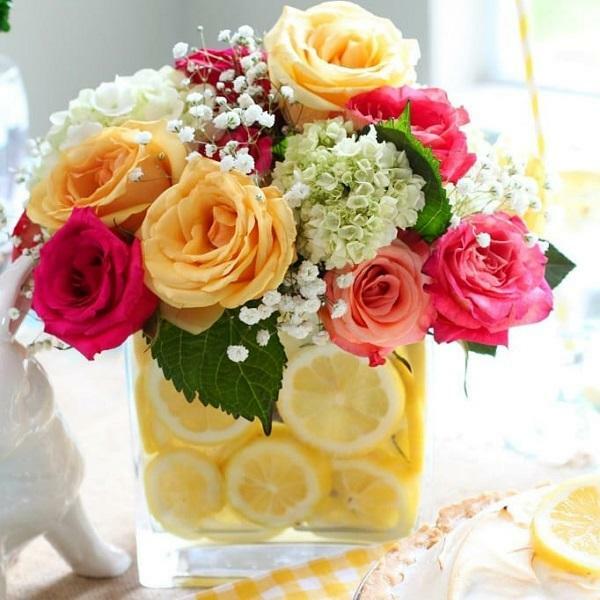 Miniature flower arrangements will be a good choice for decorating your table for guests. 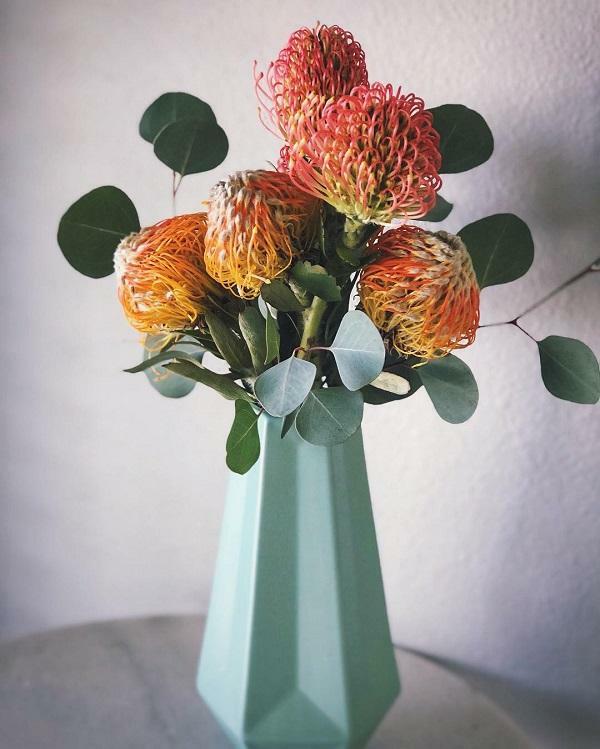 You can cultivate these flowers in your garden and here’s how to easily arrange it to become a beautiful decoration of interior of your home. Simple but nice. 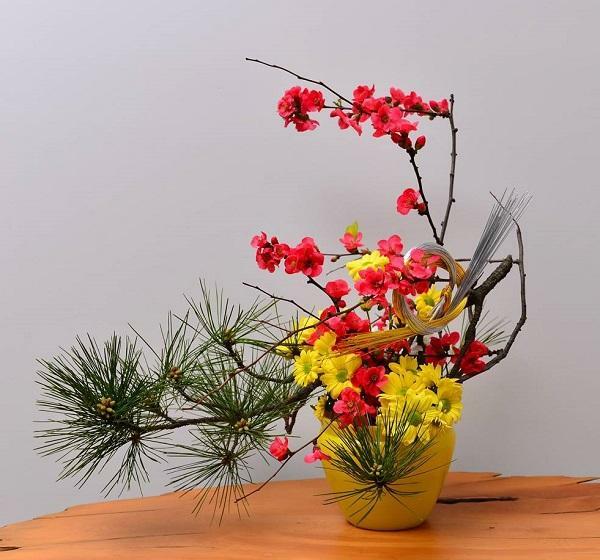 Who says that branches of evergreen trees can not enrich the bouquet of flowers. It can, here’s the evidence for that. Yellow rose can mean that someone wants to be only your friend, but also mean jealousy. Use scotch tape glued as a chessboard to fix flowers if your flower pot is wide. 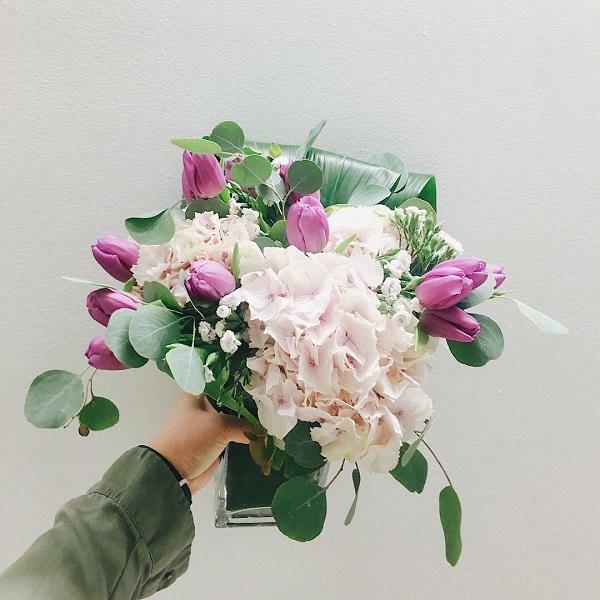 When you carry a bouquet, flowers need to go up so it won’t be damaged. The bouquet needs to be worn in the left hand so that the right hand is free to handle. 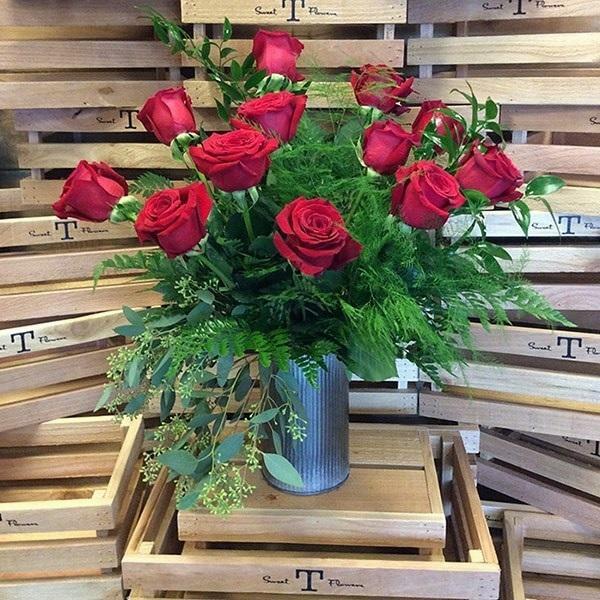 Not just boxes, crates and vases need to be used for flowers here is another creative idea. 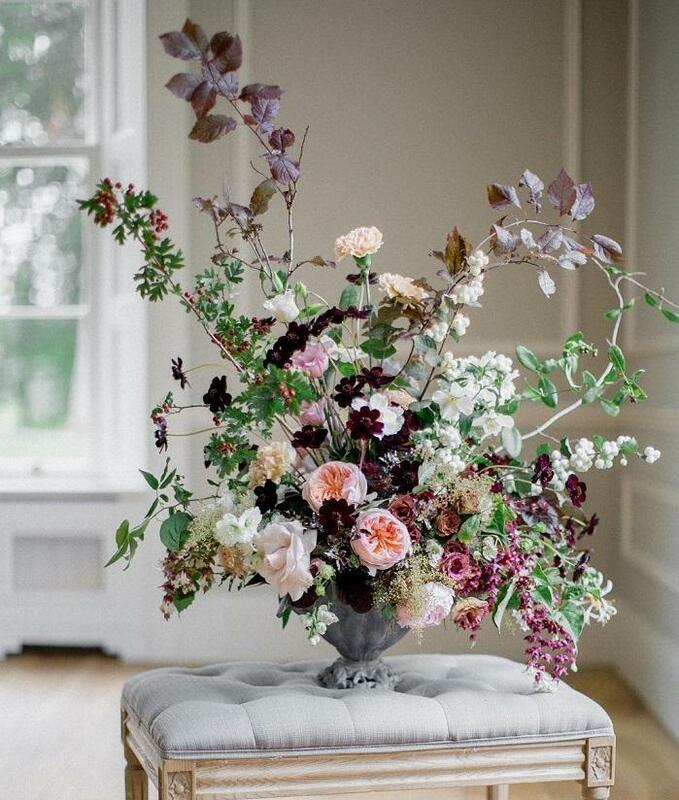 A high floral arrangement will be great for the decorations of a round table. Another high arrangement with not so frequent selection of flowers. It looks very relaxed and spontaneous and therefore modern. It will greatly fit in some minimalist apartment.